As part of the Foodbuzz Tastemaker Program we were challenged to create a spring brunch dish using King’s Hawaiian breads. We jumped at the chance. King’s Hawaiian rolls are a staple in our house. It’s great toasted with a smear of nutella for a quick snack or served along two eggs over easy for a satisfying breakfast. King’s Hawaiian bread is slightly sweet, incredibly soft and is a great canvas for so many dishes. We decided to go with a baked French Toast dish that would be perfect for spring. It’s a great dish to entertain with since you can make it the night before and baked it before your guest arrive. I am a big fan of make ahead meals! What makes this French toast special is the addition of maple bacon and Fuji apples. The bacon adds a layer of sweet maple flavor and saltiness to this dish. The apples helps cut the richness and is a wonderful compliment to the savory bacon. We top the baked French toast off with more crumbled bacon and a drizzle of maple glaze. This will be a sure hit at the next brunch or baby/bridal shower! 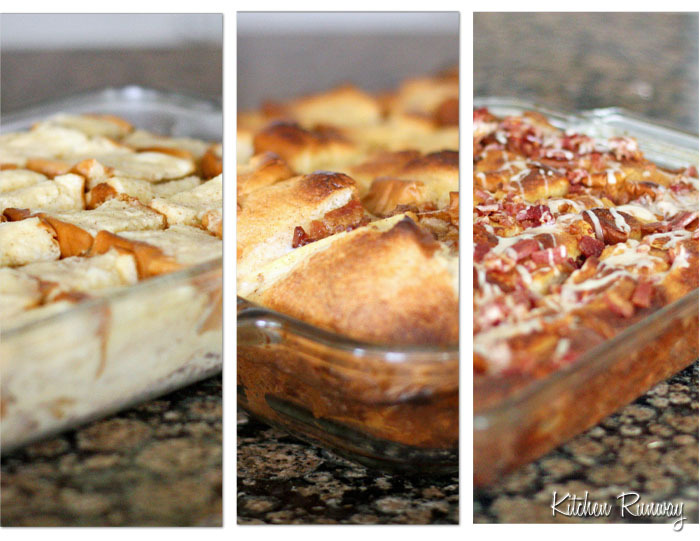 1) soaked overnight, ready to be baked 2) golden brown & puffy 3) topped with bacon & maple glaze = pure decadence! Place sliced apples in a bowl and add maple syrup and stir to combine, set aside. Gently place the remaining bread on top of the apple and bacon layer. Pour remaining egg mixture to the baking dish. Cover with foil and refrigerate overnight. In the meantime, you can cook the bacon for the topping on the stove top or bake until crispy. Sprinkle bacon on top of baked French toast and drizzle with maple glaze. Serve with additional maple glaze or syrup if you like. 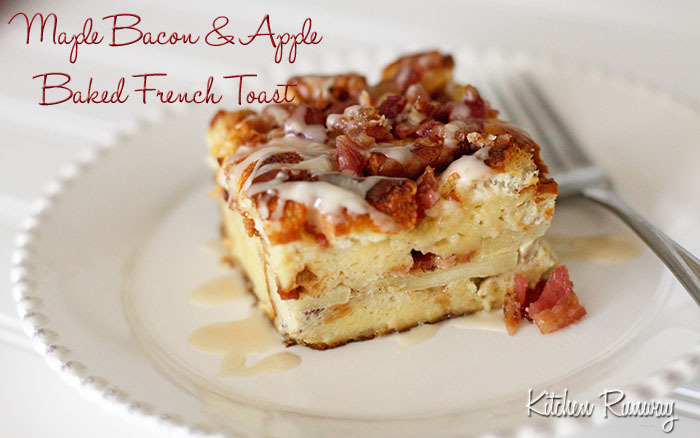 This entry was posted in Breakfast & Brunch, Easy, Entertaining and tagged apple, bacon, decadent, Easy, French Toast, party. OH! OH! oh…..! I love this. I will have some or all. Very clever girl (s) not sure who the “we” are, but the result is wonderful! Hi Renee! So glad that you love it! haa,haa my husband & I are “we” — my other half of the eating equation! what a yummy brilliant idea !! I simply LOOOOVVVEEEE it !! Genius! I love that Hawaiian bread, so any excuse to use it (plus bacon and maple syrup!) is a win in my book. Love the easy idea of of baked French toast! Great job! Holy moly. I am way too happy about finding your blog. You lured me in with the maple + bacon + french toast. 😀 Not to mention awesome pictures! WOW! This looks great! I’ve been loving bacon lately. Thanks for the recipe! a frog in the cottage: Thank you! Sweet and salty is such a yummy combo! Nichole @heatovento350: Thank you!! Hawaiian bread is so tasty! Lindsay @ Pinch of Yum: hee,hee — I’m happy that you found us too!! The Teenage Taste: Definitely can’t get enough bacon! Thank you!! Priscilla! You should – it’s definitely keeps you on your toes when you’re challenged to think outside the box with a given products/ingredients. Thank you — it’s decadent and rich…but oh so good! Honestly, dear goodness, I need some RIGHT NOW! I love EVERYTHING about this. The best french toast I ever had was made with big slabs of King’s Hawaiian. I’ve got to try this version next time we have company. Nice to meet you this weekend, I look forward to keeping up with your blog! This looks absolutely incredible. I can’t stop thinking about it. This is just all kinds of gorgeous!! Oh….where has this been all my life!?!?!?! Another wonderful recipe from you that I can’t wait to try!!! Oh my, this looks absolutely HEAVENLY!!! It’s on my list of “must try now” recipes. Thanks so much for sharing! I’m bookmarking this one. I love overnight recipes and this sounds like a fabulous flavor combination. These look absolutely delicious. My husband loves, loves, loves bacon… I can’t wait to surprise him with these. Thank you so much for the wonderful recipe! How wonderful does this sound??!! How long do you dry the cut buns? Just on the counter or do you put them in the oven at all to dry. Thank you so much for sharing! I found your lovely site on FoodBuzz and how happy that I did! This looks dreamy and delicious! 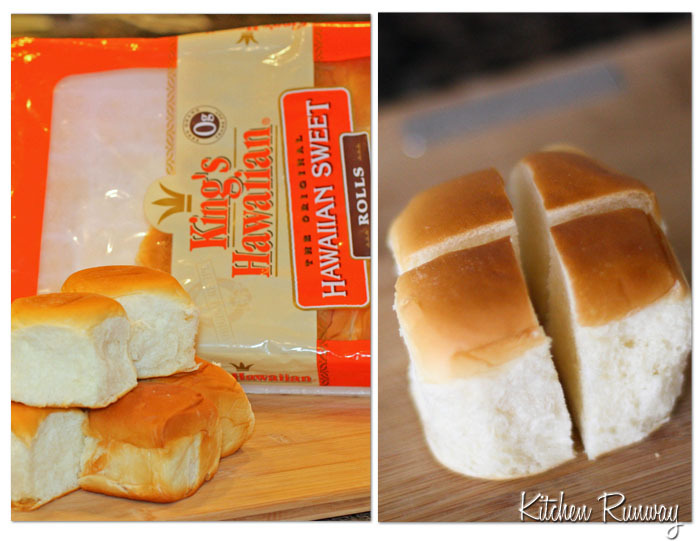 I like what you did with the King’s Hawaiian rolls – what a great idea! I could eat the whole pan to myself of this French toast. Anything and everything tastes delicious with bacon. =) Deliciously done! Julia: Thank you!! It definitely hits the spot if you’re craving sweet & savory! Sarah: It was great meeting you too!! Thank you for stopping by. Gotta love King’s Hawaiian Bread. Can’t wait to see what you & your guest think! 🙂 Take care! Mary: Thank you!! Glad you found us and hope you visit again soon! Take care! FoodieInterrupted: Awww — thank you!! I appreciate it!! Erica: You’re welcome and thank you for visiting!! It is heavenly….and sinfully indulgent at the same time! Enjoy!! Barbara Schieving: Yay– hope you make it soon!! Mrs. HungryHarp: You’re the best wife ever – surprising your husband with breakfast!! 🙂 Take care! Kelly: Thank you – hope you & your guest love it!!! ACupofThis: You’re welcome & THANK YOU!!! Catherine: So happy your found us!! Thank you and hope you visit again soon!! Have a great day! Cristina: Thank you!! You’re 100% right — bacon makes everything extra delicious! Thank you for stopping by!! Take care!! Lindsey@Lindselicious! YAY!!!! I’m so glad that you made it and that it was a hit!! I can’t wait to see the post and pictures!! Woothoo! Anijade: Good luck! I hope it’s a hit with your staff! Take care! Made this today for Father’s Day!! OMG! It was amazing! My picture was no where as pretty as yours, but we all, including 3 kids, ate it all up! Will be posting on my blog and linking to your amazing site!! Vanessa! Yay!! I’m so glad that you and your family enjoyed it!